The Merlin entertainments have pressed the right nerve introducing the Legoland in 2012! Sixth in the whole world, it finds place as the first Lego-theme Park in Asia. With a bag full of fun, Legoland Malaysia is a complete package for the whole family! The theme park caters to the needs of individuals from all age groups and ensures complete entertainment value. Right from food to rides, the innovative themes to shops and dining, every single theme is so intriguing that it would be no wonder if you wish to travel to Malaysia right away even if you have seen it once! The park is spread in an abundant area of 76 acres and is open all year round. The themes in the park include a lot of variety. The entrance marks a large traditional main gate with LEGOLAND in the upper case as its trademark. Right from the entrance the contagious vibes of energy stick around you and seem to never let go! A big Lego outlet provides you with a lot of variety of Lego toys for all the kids. The toys even include DVD sets, books and other merchandised Lego products. Another attraction is the Lego Building Activity which encourages innovative and creative ideas to build skyscrapers, houses etc and also plan and test them after building them! This ensures not just fun but interactive lessons with some brainstorming activities. There are a lot of computer games and robotics to try your hands on! The simulation programmed for these games is marvelous! An interesting monorail ride awaits you in the form of Sky Cruiser, in which you can control your vehicle by pedaling it through the track that runs around the whole park and gives you a lovely view of the whole set up; through the kids’ park and the interactive themes. Amazing and thrilling rides like the junior tower ride which propel your vehicle seat upwards to the top and then drops you off by letting the seat go, and many more are simply breathtaking!! For the kids in the age group of 2-6, there is a special area allocated just for them to make them explore new things and let them have their own idea of fun. The Lego Duplo is this amazing area where different interactive games to help kids find their creative edge are introduced. Princess themed castle, Lego Knights, the Lost Kingdom Adventure, prototypes of the different wonders of the world are other few attractions which literally take your breath away! 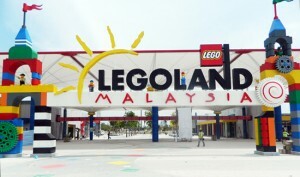 The Legoland Malaysia witnessed some 1.5 odd million visitors when it opened the gates for the public. The response to this innovative creation was outstanding. The numbers seem to keep growing as the rides and the themes are available all year round. The tourism of Malaysia has substantially gone up due this theme park and is predicted to rise in the coming years. If you are planning a trip and you wish to travel to Malaysia, make sure you visit the Legoland because you seriously would be missing on a lot if you don’t! Since it ensures a complete fun-package for all age groups, you need not be skeptical at all! It’s the perfect place to go for all those out there looking for FUN! !